Knowing your speed and glide ratio is not necessarily important, but it is fun, and if you maintain an awareness of how you are flying on each jump then you can use the data as a tool to progress. 1. Wind and thermals can have a tremendous effect on flight data. The speed and glide recorded on the GPS is never your true speed and glide. A head or tailwind can change your l/d by a full point of glide (i.e. 3:1 to 2:1) and will obviously also change your groundspeed significantly. Your GPS measures horizontal groundspeed, not airspeed. 2. 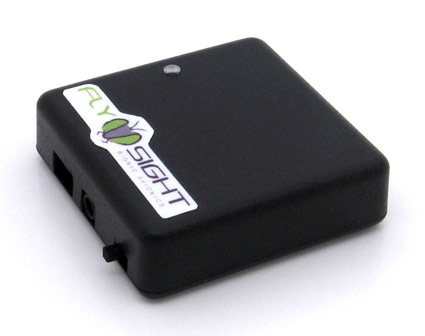 The main feature of the FlySight is the audible tone which indicates glide performance. This is a fun and useful tool which can really improve your glide performance. Practice with it in the skydive environment and calibrate the volume carefully before you take it BASE jumping. 3. Even if you never use the audible tone and don't think you need it, the FlySight is still one of the most compact quality GPS units that you can buy. Mine works well slipped into my arm wing, or fastened to my helmet.